Many parents feel they should be doing more at school. For parents who are busy, it is important to remember that supporting learning at home matters. Providing opportunities for children to learn new things, reading and supporting their interests makes a big difference. Parents don’t need to be an expert; supporting and encouraging learning is enough. In this context ‘family’ refers to all the people who share in the caring and nurturing of a child. Immediate family, like mums, dads, step-parents, foster parents or adopted parents, and siblings, and extended family like grandparents, aunts and uncles, and cousins can all have a strong role. Additionally, ‘family’ may also be people who are not relatives, people who play a special role in the life of your child, such as a close neighbour or family friend. Family-led learning is focused on high aspirations for children, shared reading, a positive environment for homework, parent-child conversation, a cognitively stimulating home environment and support for social and emotional wellbeing. Here are some tips and ideas about the things you can do to engage the whole family in your child’s learning. Picture book with dad before bed, grandma’s favourite story on Skype, a traditional family recipe, map and street signs with mum on the way to swimming, an email from grandpa, a text from a friend, a story on an iPad with a sibling. A shopping list with mum, a letter to a teacher, an invitation to a friend, a secret message to dad, an envelope to a grandparent, a birthday card to a cousin, a scrap book of a family holiday, a story with a neighbour, record facts with an uncle, draw and colour in with brothers and sisters. The message is talk, talk, talk, and then talk some more. Point things out, ask open questions, ring uncle and talk about the footy, talk about big ideas, passions, interests, favourite food, movies and books with aunty, current affairs with step-dad, family history with grandparents. Talk with the whole family at dinner time, travelling to and from school with dad, on Skype with mum on a business trip, whilst playing together. Make up stories - kids love making up “silly” stories and nonsense rhymes, include dress-ups, make a puppet show. Play a family game of cards, do a crossword or number puzzle with grandpa, build with Lego with sisters, cook and bake with aunty, set the table, sort the recycling, count, conduct internet research with a big brother, knit with grandma, care for a pet, construct a block tower, match shapes and pictures, string beads in a repetitive pattern. Pretend, imagine, play games, construct, build a cubby with dad, dress up with cousins, hide and seek with friends, soccer with the neighbours, experiment with different sensory experiences like sand, water, rocks, and sticks, for sustained periods. Tell a joke, make up rhymes and riddles, family concerts, watch a funny movie. 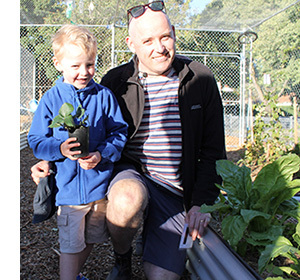 Go for a family walk or bike ride, dance, jump on the trampoline, swim, backyard cricket, plant a vegie patch with dad, swing and climb at the park, play ball games, run, skip. Go where there’s room for children to run, explore, climb safely. Let kids try out different sports, and give them an opportunity to play team games - taking turns and learning rules, any opportunity for children to participate with encouragement in contributing to a team will strengthen self regulation and collaboration. Take grandma to the museum or art gallery, story time at the library with mum, National Park adventure with the family, a holiday at the beach, a bus ride to the city to go on the merry-go-round and buy an ice-cream, listen to a concert, shop together at the fruit markets, swim at the Cotter, camp in the backyard with cousins, fish and chips at the lake.